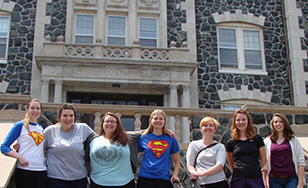 Clare Boothe Luce students Heather Carlson, Emily Ciernia, Hope Haugstad, Abby Panfil, Krissa Boman, Jenna Thomforde and Elizabeth Gearhart. What do a turtlebot, a cost-benefit analysis on vaccinations, and data clustering algorithms have in common? They were all studied by students taking advantage of their summer vacation to log some research hours. Thanks to a grant from the Clare Boothe Luce Program, faculty members supervised a variety of projects that helped female students in STEM fields gain valuable hands-on research experience, which can be a rarity for undergraduates. "It has been absolutely amazing," said Elizabeth Gearhart, a senior math major. "We had a lot of say in what we were going to work on, so that's really exciting because it's something that we're interested in." Krissa Boman, a sophomore math major, and Gearhart used an analytical model called game theory to study the pros and cons of vaccination. "We were trying to see if the monetary value that we come up with would outweigh the value of dealing with disease and the outcome," Boman said. Meanwhile, Heather Carlson, a junior studying computer information systems, worked with associate CIS professor Tom Gibbons' "turtlebot," a robot that uses a sensor to move around and map out its surroundings. She worked on programming the sensor. Junior Jenna Thomforde spent her time on a biochemistry project, isolating molecules that could be studied as anti-cancer agents. "A lot of it's critical thinking and figuring out the problem, and working around it," she said. "Even in six weeks, I've learned so much." Abby Panfil, CIS sophomore, and Emily Ciernia, CIS senior, collaborated on a data set sentiment analysis, studying programs that measure positive or negative feelings associated with products, as in online customer reviews. They had to figure out how to download and work with huge data sets containing millions of reviews. "I think that learning how to convert the data is the biggest skill that I've learned," said Panfil. CIS senior Hope Haugstad also worked with data, studying analytics and clustering algorithms. She's interested in whether data similarities, or "clusters," have predictive tendencies. "My overall question became, ‘Is everything just relative, or does it matter what you're looking at? Can you predict things based on how many are in the cluster?'" she said. For example, she examined a database called Movielens to see how users tagged the movies they watched, studying whether she could find a correlation between the tags and what movies users liked. She has enjoyed the collaborative nature of the research. "Sometimes you're not even working on the same thing, but you end up talking about the same things." The Clare Boothe Luce Program awarded a three-year, $196,200 grant to the College to encourage female students to pursue science and math careers. The award is one of only 10 Clare Boothe Luce grants awarded by the Henry Luce Foundation in 2014.